It is inevitable that your sink will one day become slow to drain. 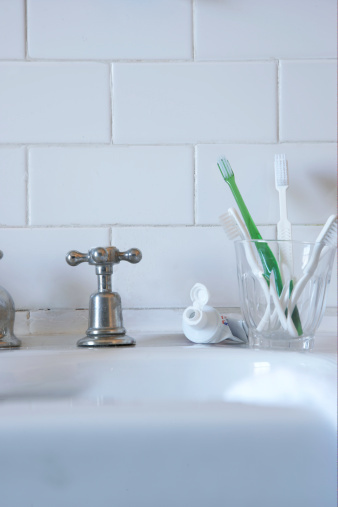 Over time, your bathroom sink drain can become clogged with a buildup of things such as toothpaste and hair. These items can cling to the inside of your PVC pipes and become a real nuisance as they block your drain. You can help to prevent this problem with periodic cleanings of your PVC pipes using a few common household items. Toothpaste buildups inside your PVC pipes can encourage bigger problems down the road. Run hot water through your drain periodically. This will help to clear everyday buildup from the inside of your pipes. Pour 3/4 cup of baking soda into the sink drain. Pour 1/2 cup of vinegar into the drain and immediately plug the hole with a rag. Combining baking soda and vinegar causes a chemical reaction that will clean the PVC pipes. Let set for about 30 minutes before rinsing the drain with hot water. Consider using a chemical drain cleaner for tougher buildups. Purchase a cleaner that is safe for use on PVC pipes. Follow the manufacturer's instructions for applying the chemical cleaner to the drain. Pour lemon juice into your drain to help loosen toothpaste buildup and any odors. Insert a plumber's snake into the drain to clean large clogs or buildups. Run the snake in and out several times to clean the inside of the PVC pipe. Flush with hot water when done. Call in a professional plumber for stubborn clogs that you cannot clear.